If you want to chat anonymously with someone near you using Facebook Messenger app, then try NearGroup. It’s an online chat dating app that uses chatbot to connect with people nearby, join group chats, follow live stories and conversations without revealing your identity. The app gains popularity in the Philippines and other countries through Facebook sharing where users share invitations and their stories anonymously. 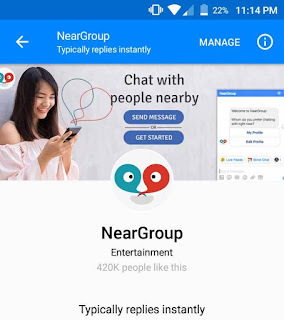 One good thing with Near Group is that you don’t need to download and install on your Android and iOS (iPhone) as it works instantly by only using your Facebook Messenger. 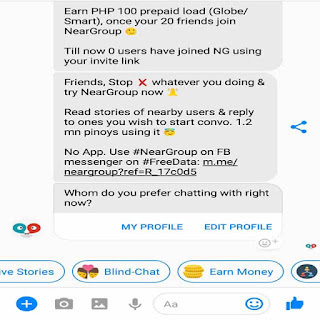 NearGroup works on Facebook Messenger, no installation needed if you already have the FB messenger app installed or pre-installed on your phone. How to use or open NearGroup? Open your FB Messenger then search NearGroup. Select the NearGroup FB App page. Click on Get Started to start using the app. Once you started, NearGroup chatbot requires few details and preferences before you start chatting. Below are the few questions you need to answer. How to earn free prepaid load (Globe/Smart) using NearGroup? On NG chat menu, just select Earn Money option. Tapping it will give you referral code like this “http://m.me/neargroup?ref=R_1w8ZjR”. 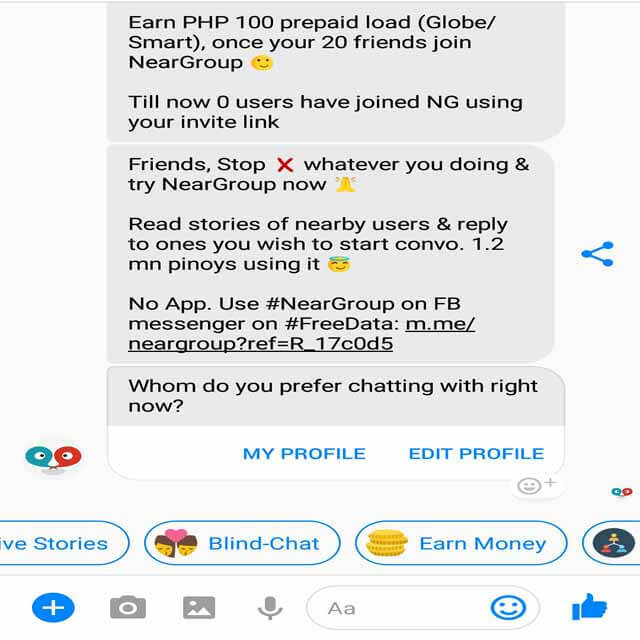 You can share it to your friends and if 20 of them will join NearGroup you can earn P100.00 load. MENU – to display and go back to main menu. Tips: Blind-chat with a girl can be used only 5 times a day. Once you reach the that you can still you Neargroup other features. A girl nearby also can be used every 12 hours.